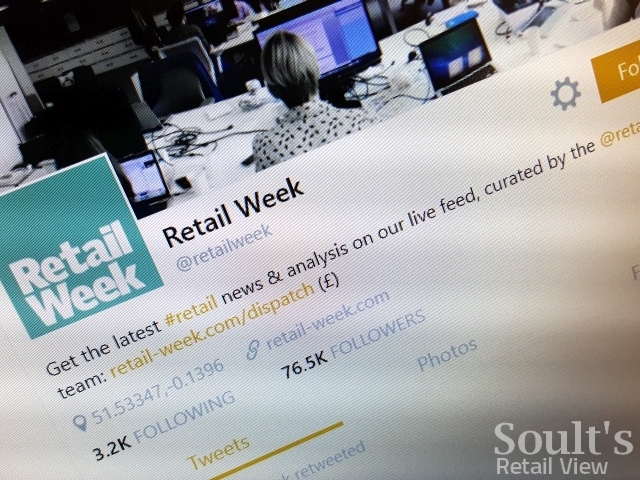 Not surprisingly, Retail Week ranks highly for influence… but how high? Back in April, Newcastle-based influence analysis platform Lissted prompted quite a lot of reaction when it published its list of the 250 most influential Twitter users in the North East. I was ranked as number 109, incidentally – and as the region’s number 1 blogger on Twitter. The chap behind Lissted, online PR entrepreneur Adam Parker (@AdParker on Twitter), is someone I’ve known for a long time, and this latest venture is fascinating for how it challenges, and unpacks, the way that individuals and organisations build influence on Twitter. It’s easy to look at Twitter accounts and suggest that someone with 10,000 followers is more ‘successful’ than one with 1,000 or 100; however, this is a fairly crude measure. Conversely, you often also come across qualitative lists of the top people on Twitter – like the Journal’s North East Twitterati – which it’s lovely to be a part of, but which are purely subjective. Where Lissted is interesting is that it uses an algorithm to analyse Twitter users’ relationships and interactions, rather than simply who is saying what to how many people. Moreover, it can also segment the Twitter community by criteria such as geography (e.g. looking just at the North East), business sector or job role. Lissted can now apply its algorithm to virtually any potential community, so I asked Adam to look at the UK retail sector. You can scroll down and see the full list of the Lissted UK Retail Top 100 at the bottom of this post, or download the full list in spreadsheet format from the Lissted blog. In September 2015, Lissted analysed data relating to a sample of 2,714 of the top retail-related Twitter accounts in the UK, which it had initially identified using its proprietary algorithms. The data included 1.6 million follower relationships and over 35,000 retweets, replies and mentions by these accounts. Having generated the Top 100, I helped Adam confirm the categorisation of each account by type, and verified that those included in the list could, indeed, be categorised as being primarily ‘retail’. On this basis, accounts that sometimes tweet about retail but are primarily, for example, focused on wider marketing or business issues – such as Econsultancy (@econsultancy) and Robert Peston (@peston) – were excluded from the sample. Conversely, others such as former Retail Week editor Tim Danaher (@timdanaher) and Telegraph journalist Harry Wallop (@hwallop) were included in the list, because while their current positions are not entirely retail-focused, their previous retail roles mean that they retain a particularly extensive set of connections and influence within the Twitter retail community. Interestingly, Lissted ran a test run of the UK Retail Top 100 in July, and again in August. This demonstrated some churn from month to month, as 20 or so accounts, mostly in the lower reaches, dropped out of the chart to be replaced with others. However, the top 50 remained remarkably stable throughout, reflecting the generally well-established positions of the top influencers. So, the question you all want to know then – who’s top of the chart? For anyone who’s on Twitter and involved in the retail sector, there’s little in the top 10 above that is likely to surprise. Indeed, when Adam – who obviously isn’t a retail expert – used Lissted to generate this list, I was struck by just how logical it all seemed. After all, there are probably few of us involved in retail who don’t follow and engage with all of the above. Notably, the list emphasises Retail Week’s status and influence within the sector, with the magazine itself (1), its Executive Editor George MacDonald (3) and its Content Editor Nicola Harrison (10) all sitting within the top 10. You might question why Mary Portas – arguably the best-known individual in UK retail – comes in ‘only’ at number 8. Clearly, while almost anyone who’s anyone in retail follows her, she tweets relatively infrequently, and tends not to interact much with others in the sector – which is why active, engaged (and engaging) Twitterers, such as the omnipresent Neil Saunders (2), rank higher according to Lissted’s influence algorithm. What types of organisation and individual are included in the chart? We’ve just seen the overall top 10, but clearly, within the retail sphere, there are a wide range of types of Twitter account, from individuals like me to actual retail stores, as well as a multitude of people and organisations engaged in areas such as media and analysis. As you can see, one interesting feature of the Lissted UK Retail Top 100 – and mirrored in the top 10 that we saw a moment ago – is, ironically, the comparative lack of retailer Twitter accounts. Though ‘Retail Brand’ is still the most common type, it nevertheless accounts for just a fifth (19) of those accounts featured in the chart. That’s not entirely unexpected, however, as an effective retailer Twitter account should typically be communicating primarily with its customers, rather than with industry peers. So, with this in mind, and given their prominence within the retail community, it’s little surprise that over half the chart is composed of analysts (14 individuals and 7 firms) and the media (18 journalists and 13 publications). As well as looking at the overall chart, it’s interesting to see, for key types, which Twitter accounts are most influential compared to their direct peers (or competitors, as appropriate). Among retail brands, it’s little revelation that the Twitter accounts for John Lewis, M&S and Waitrose come out best. Not only are all three retail bellwethers – that every self-respecting person in retail tends to follow – but all three excel at sharing interesting content while also doing a sterling job of responding to other users’ questions and mentions. Credit to Sainsbury’s, meanwhile, which achieves the unusual feat of having a corporate/press account (@SainsburysNews) that is almost as influential as its core @sainsburys consumer one. Just as the top retail brands ring true, it’s hard to argue with the five highest-ranking retail analysts, either. After all, these are the guys who pop up on TV news all the time, appear in the pages of Retail Week or the national press, and, quite simply, have earned respect and influence by always having something timely, relevant and insightful to say. Interestingly, while the individuals that represent the big retail analysis firms – such as Neil Saunders from Conlumino, Bryan Roberts from Kantar, and Natalie Berg from Planet Retail – perform strongly in terms of Twitter influence, you tend to have to move further down the chart to find the accounts of the companies themselves. Again, it’s not that much of a surprise, to be fair. There’s a reason why we call sites like Twitter ‘social media’, and however well a brand’s Twitter account does in conveying a personality, in terms of engagement there’s often no substitute for knowing that you’re interacting and building a relationship with a real, specific, human being. There are some retail Twitter accounts – my own @soult one included, to be fair – which proved quite a challenge to categorise, where the individual or organisation concerned has carved a distinct niche, often based around the strength of their personal brand, that could arguably straddle more than one type of role. In the end, we came up with the ‘Campaigner’ type to categorise those who aren’t really a ‘Personality’, ‘Analyst’ or ‘Commentator’, but whose primary purpose on Twitter is to influence, effect change, and, well, do stuff. Among these characters, the splendid Clare Rayner has the distinction of being the only individual to appear in the top 100 under three different guises: her eponymous @clarerayner account (33), but also @RetailChampion (42) and @IndieRetailUK (55). You could argue that Clare might have even more profile and influence if her various Twitter identities were consolidated under one account, but – just as is the case with my fashion site – trying to cater for all audiences via one Twitter presence most likely wouldn’t actually work. As it is, Clare’s Twitter footprint is probably the exemplar if you’re looking to see how one person can segment their online persona into different Twitter accounts in order to communicate a clear and distinctive message via each. OK, admit it – you’re wondering where I am in the Top 100, aren’t you? As you can see, I come in at number 2 on that list (behind the excellent Nick Bubb), and at number 39 overall – meaning that in Twitter terms, at least, I can claim to be more influential than the Co-op (which is at 50). 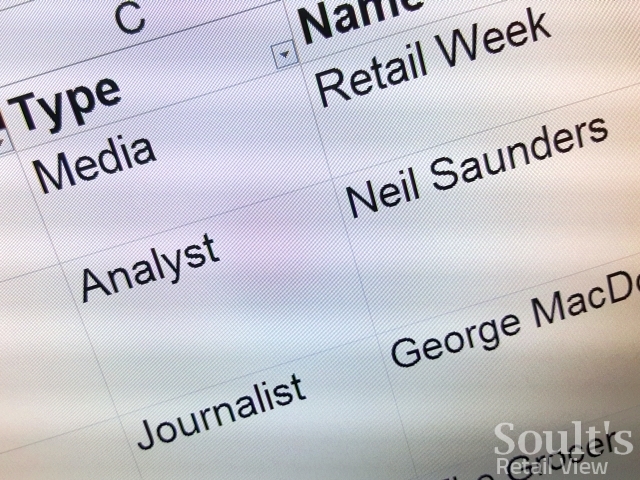 What’s fascinating, and humbling in a way, is that whatever influence I have in the retail world has been built almost entirely online, through creating Soult’s Retail View (back in 2009), and tweeting more than 21,000 times (just from @soult) over the last six years. That presence has, in turn, opened up other opportunities, whether speaking at retail events, being interviewed on BBC News, and, yes, actually generating work for my consultancy and online directory businesses as well. Crucially, though, Lissted’s analysis shows that of the other 99 Twitter accounts in the Top 100 – which are, basically, the most influential retail people on Twitter – 52 of them follow me. It’s that engagement from other key influencers that accounts for me ranking relatively highly in the overall scheme of things. So there’s a lesson there to take away – that whether your sector is retail or any other, your own level of influence is most likely enhanced if you’re able to build an online relationship with other important influencers, especially if they’re selective about who they interact with. Of course, you can’t force these influencers to follow and reply to you, but if your tweeting is consistently interesting, informed and engaging – and doesn’t veer off topic too often – it will most likely happen of its own accord. In the meantime, let’s see if the impact of this latest blog post can help me climb a bit higher than 39 next time Lissted updates its chart!